Is this the Simcity you’re looking for? Yes, it most definitely is! Cities: Skylines is almost a kick in the teeth to EA’s poor efforts of Simcity 5 and now I know the game was developed by Maxis branded studios it was EA who influenced many of the contents of that game and as such we can only blame them for the disaster that became of it though this isn’t a Simcity review, it’s a Cities: Skylines review but what does this game offer that Simcity doesn’t? For a start you don’t need to be constantly connected to the internet to play it, you can just boot it up and begin, other advantages come from it’s modding support in which you can not only edit terrain but you can even edit buildings with crazy details, couple these features with the intricate systems of traffic management and optional Steam Cloud saving and you have a winner of a city builder. 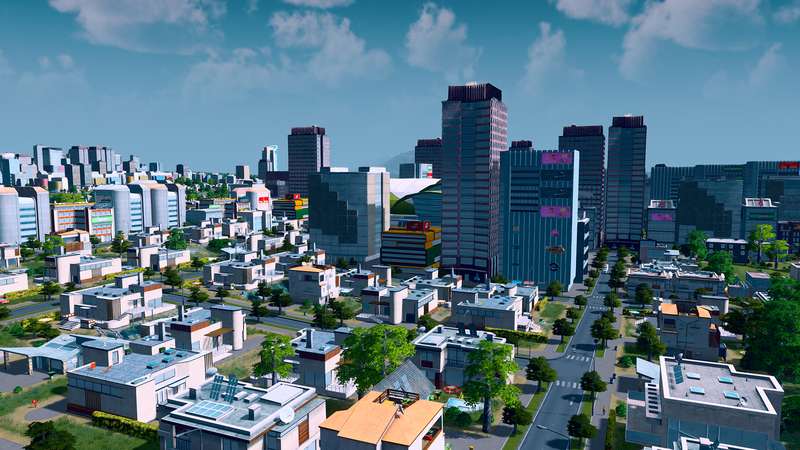 At first I was expecting your run-of-the-mill Simcity clone with all of the issues that every other Simcity clone experiences such as: poor optimisation, lacklustre graphics and a sparse amount of conent but Cities: Skylines offers everything you could ever want and more. You begin as you would in any city builder by connecting your road systems up and zoning residential, commercial and industrial areas, you also need to make sure that you’re effectively supplying enough electricity and water to each populated area of your city as well as disposing of their waste and trash, it’s not just a case of plopping down roads, zoning areas and letting the game do the work for you, you have to do the work and you have to do it well. On my first couple of cities I managed to get to around a population of 2000 before my city began failing due to lack of power and sewage backing up but on my third attempt I managed to nail the formula by combining the less efficient but greener wind turbines with coal burning power stations for a city that ran itself. If you’re going into Cities: Skylines expecting something similar to Simcity 5 then you’ll either be sorely disappointed or greatly impressed, the game really does give you control over every aspect of your town, from laying out the bus routes to selecting which side of the road you want your population to drive on. My only complaints about the game are that if you don’t manage your death care well you can have a ghost town in no time, if one person dies in a skyscraper then the entire building gets abandoned and needs demolishing and that crime seems to rarely ever take place, you can have high crime areas but very few specific crimes that lower the moral of your population ever seem to happen but other than those two gripes, this is the perfect city builder. Clocking in at a tiny 3GB and offering more content than you could ever ask for, if you’ve been yearning for that killer city builder after the magnificence of Simcity 4 then this is the game for you and even if it isn’t the game for you, it can be modded into the perfect game for you, a must have for any city building fans!